Two astronomers made names for themselves in the late 1950's and early 1960's by cataloging galactic nebulae from the newly-available Palomar Sky Survey plates. One was Beverly Lynds, whose catalogs of both bright and dark nebulae were published in the early 1960's and are still a standard reference source. The other was Stewart Sharpless of the U.S. Naval Observatory, who published his catalog of 313 HII regions north of declination -27 degrees a few years earlier, in 1959. 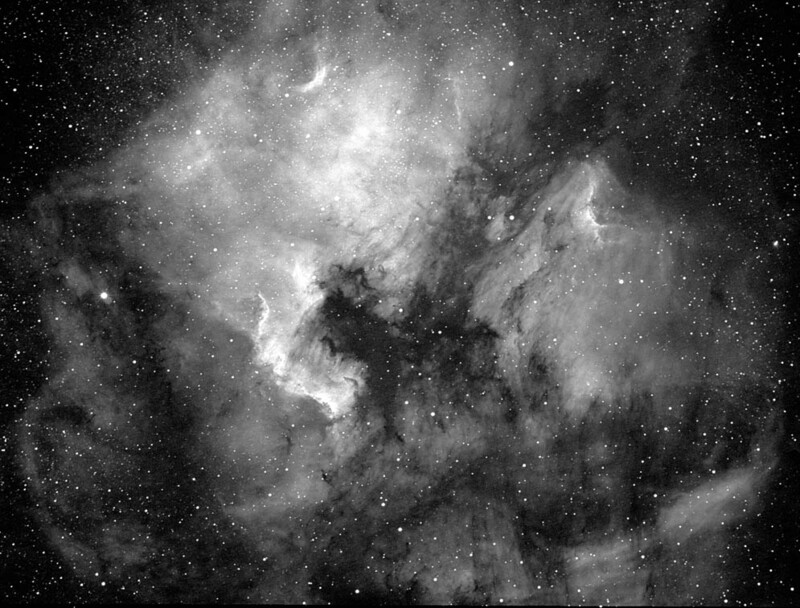 From stunning nebulae known to all amateur astronomers, including such Messier favorites as the Swan (Sharpless 2-045) and Orion Nebulae (Sh 2-281); to well-known NGC objects like the North American (Sh 2-117) and California Nebulae (Sh 2-220); to faint previously-uncataloged obscurities never seen visually; they're all there, in the Sharpless Catalog. (My selection excludes Messier and well-known NGC objects. )Two of the best-known Sharpless objects not in the NGC are from the Index Catalog: the Flaming Star Nebula (Sh 2-229) in Auriga and the Cocoon Nebula (Sh 2-125) in Cygnus. The best-known Sharpless object that didn't even make the IC is probably Barnard's Loop (Sh 2-276) in Orion, which has been observed naked eye with an OIII filter. My own interest in the Sharpless Catalog was piqued last winter on the Internet. My deep sky challenges relating to two obscure Sharpless objects drew enthusiastic responses and resulted in exciting observations of objects previously thought to be extremely difficult or impossible. Ironically, neither was an HII region. The first was Sharpless 2-240, better known as Simeis 147, a supernova remnant in Taurus included in Rich Jakiel's list of Ultimate Challenges as one of the seven Mount Everest's of amateur astronomy. Much to his surprise, Rich saw a stunning "...interwoven tapestry of filaments and nebulous arcs against a beautiful starry background." His observing companion, Gil Shillcutt, traced two long arcs, "easily visible", that, "...like the Veil, could be followed for approximately two degrees around the periphery of the object." The second was Sharpless 2-216, thought to be the closest planetary nebula. Jay McNeil called it "definitely first class 'retinal torture'.... If anyone even suspects this one, I definitely want to know about it." Well, Dave Riddle had a look and "...quickly spotted a dimly glowing vaguely defined filament....It wasn't supposed to be this easy!... I slowly accepted that the glow was the 'impossible' planetary and it was not the exceeding difficult (or invisible) object I had suspected it would be." One can't help wondering if there are other deep sky gems lying buried in the back pages of the Sharpless Catalog.